tomato paratha recipe | tamatar ka paratha | tomato onion paratha with detailed photo and video recipe. 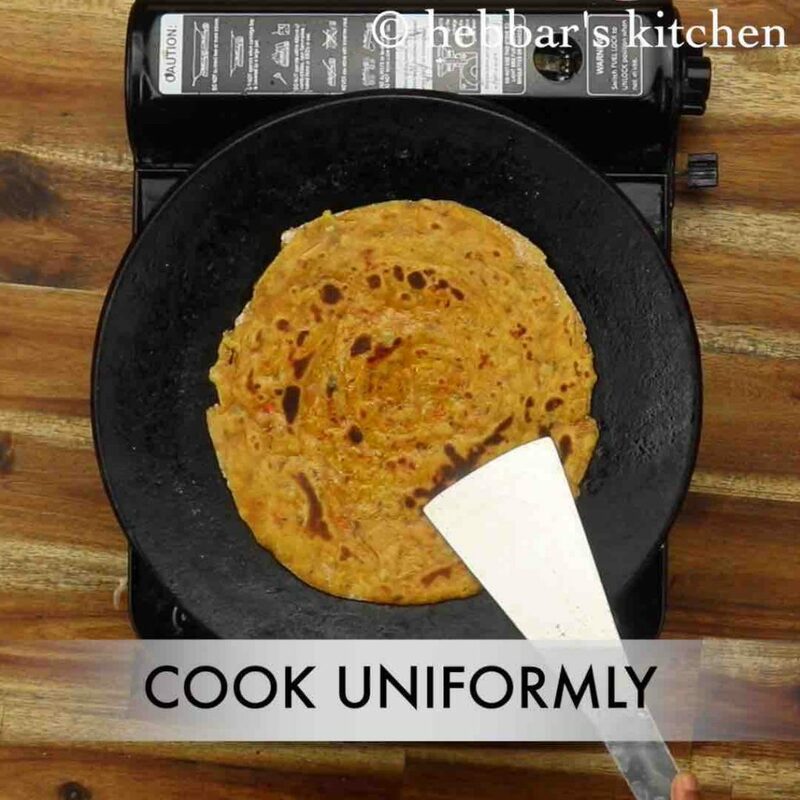 a unique and flavoured paratha recipe made with spiced tomato puree and wheat flour. 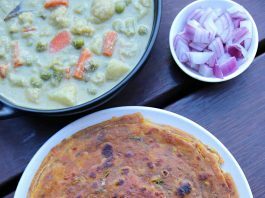 the recipe is similar to the popular thepla recipe and has a similar texture and colour but has a strong tomato flavour to it. 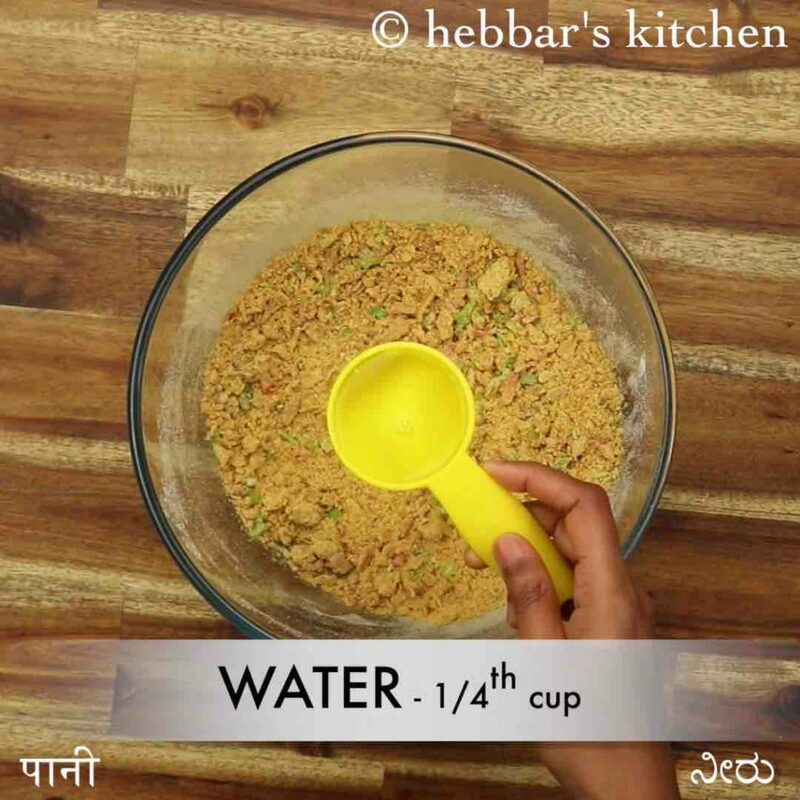 it is very simple and easy to make and can be ideal for kids tiffin box or lunch box with a pickle or raita as a side dish. tomato paratha recipe | tamatar ka paratha | tomato onion paratha with step by step photo and video recipe. paratha recipes have always been an integral part of north indian cuisine and are made for various occasions. 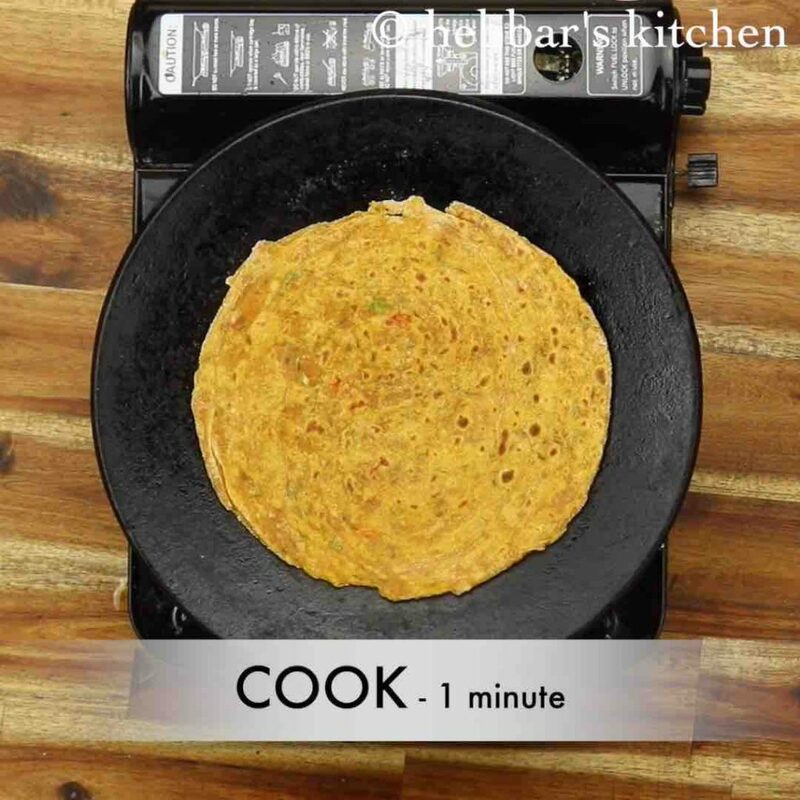 typically the most popular paratha’s are the vegetable-based stuffed paratha. but then there are others where the vegetable puree is added directly to the wheat dough and tamatar paratha is one such variety. the concept of tomato paratha maybe not common for many and may be skeptical to even try it. 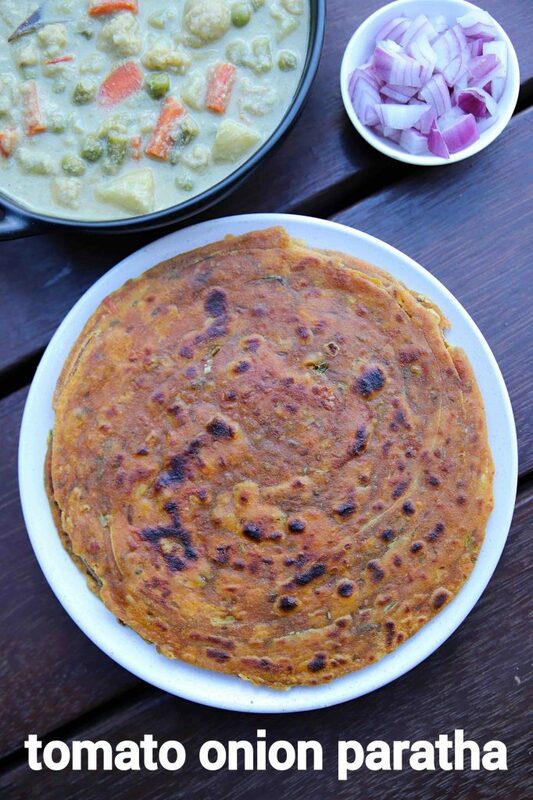 perhaps for most of them, the impression of paratha means a stuffed roti with mashed and spiced vegetables. well, i totally understand it and completely acknowledge it. but trust, me this is one of the easy and simple spiced roti and can be served for any purpose and occasions. i personally make it for my breakfast and serve it with either curd or pickle and you would never disappoint. in addition, i also try to experiment the recipe by adding other vegetable purees along with tomato. 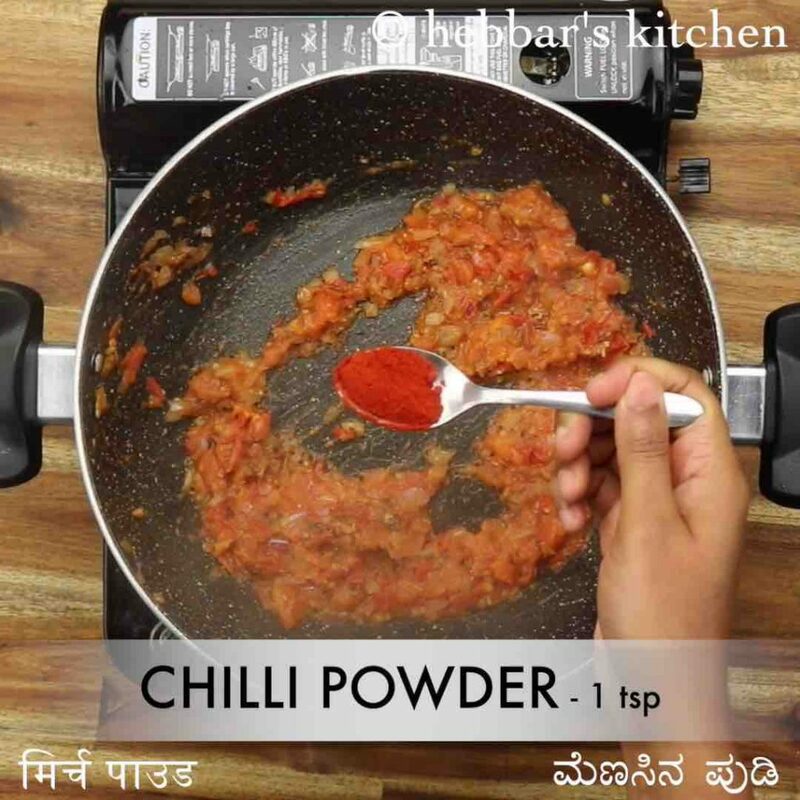 my personal favourite is palak and methi leaves and tomato puree which add the flavour of palak and tanginess of tomatoes. but i have not added in this recipe and it is not something everyone may prefer. furthermore, some tips, suggestions and variations to the most flavoured tomato paratha recipe. firstly, i would heavily recommend to use ripe and juicy tomatoes to the masala paste. as matter of fact, you can also use the store bought tomato puree to make these tomato roti. secondly, i have used wheat flour to make the healthy roti. 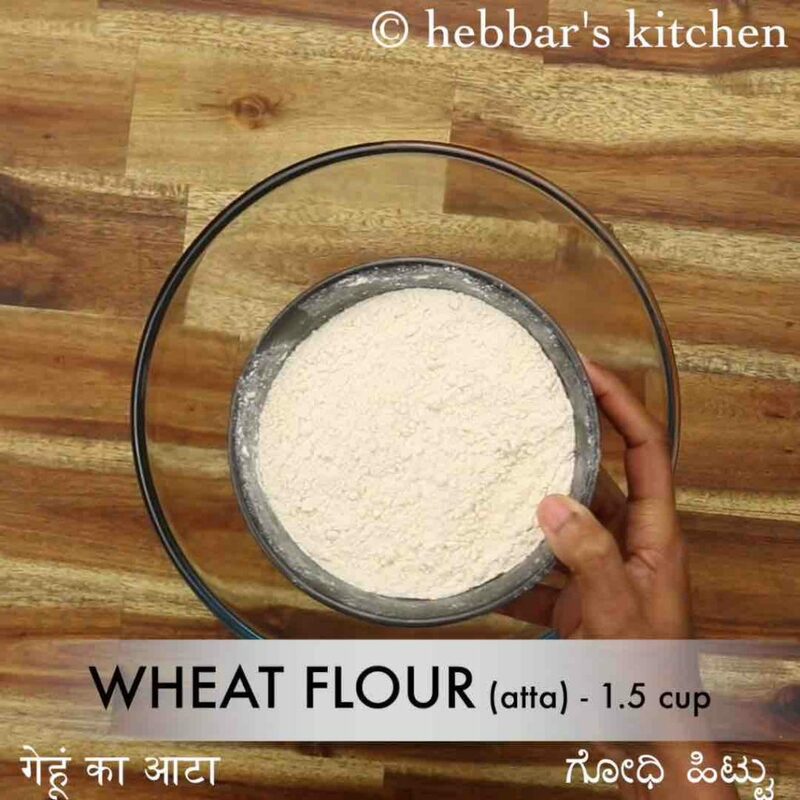 but the same roti or paratha can also be made with plain flour or maida. my personal preference is maida but i have used wheat to make it healthy and edible. 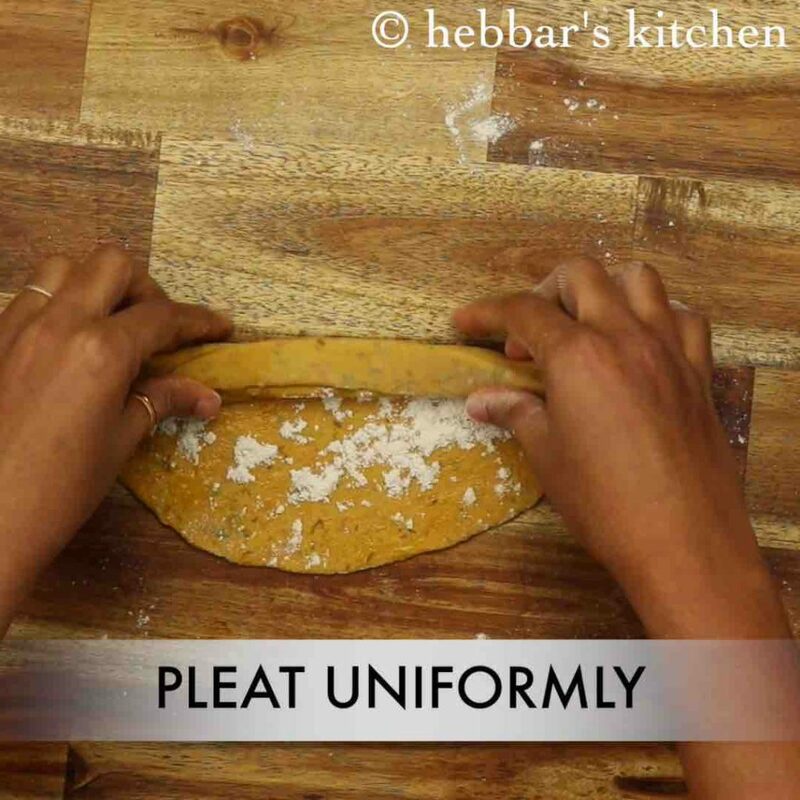 lastly, i have tried to make these paratha flaky by rolling it with layers. 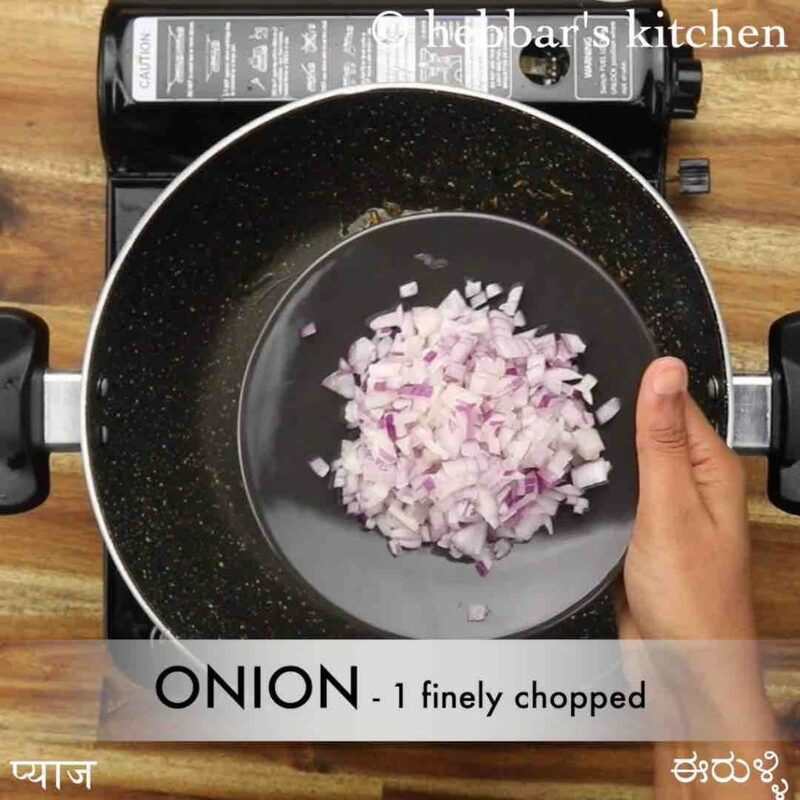 but that is completely optional and you can just roll it like chapati without any extra effort. 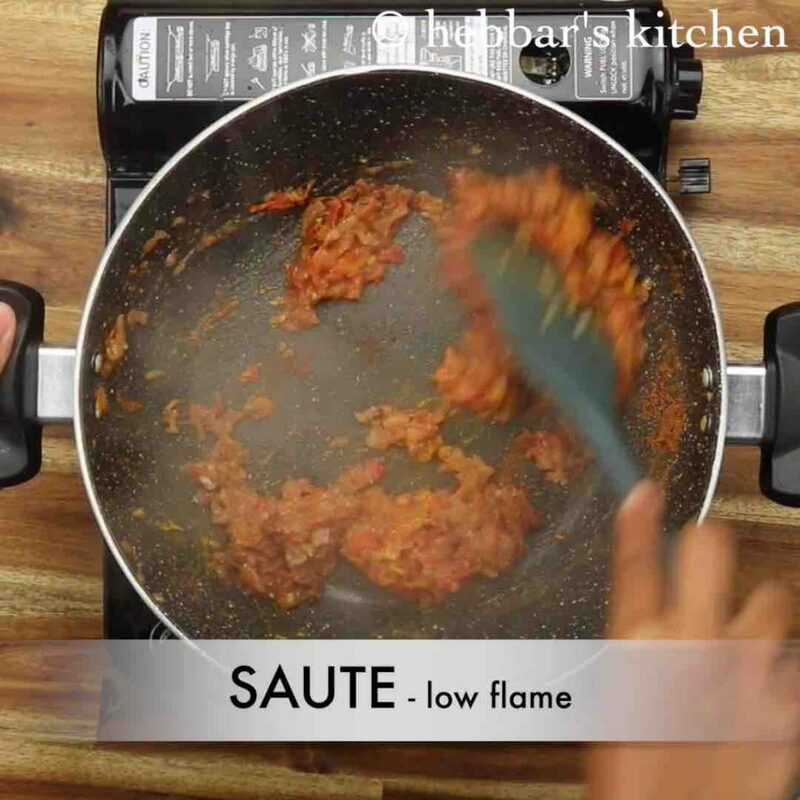 firstly, in a large kadai heat 3 tsp oil and saute 1 tsp cumin and 1 tsp kasuri methi until it turns aromatic. now add 1 onion, 1 tsp ginger garlic paste and saute well. further add 3 tomato and saute well. 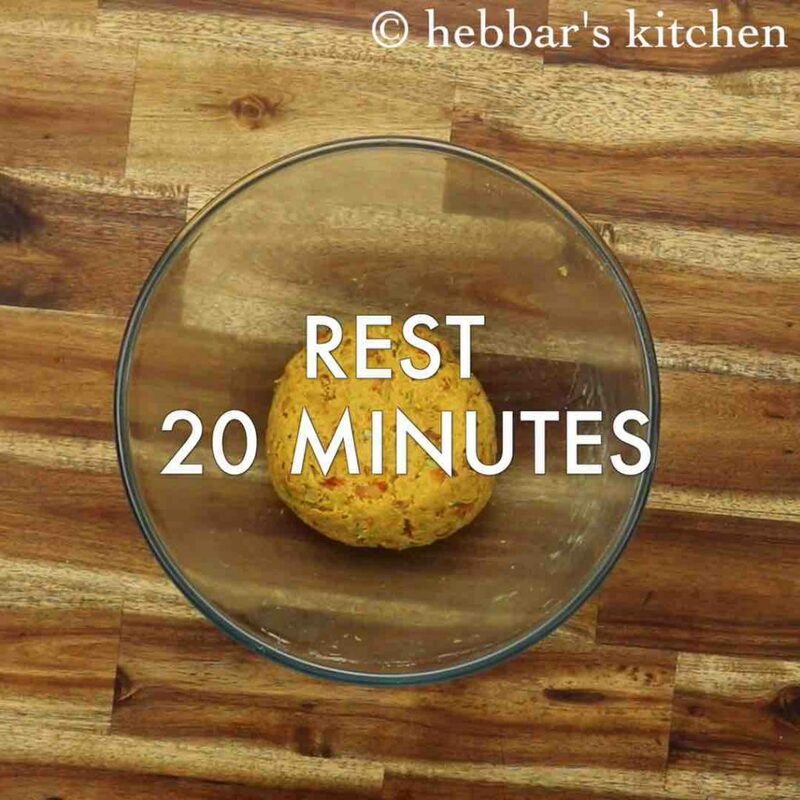 keeping the flame on low add 1 tsp chilli powder, ¼ tsp turmeric and ½ tsp garam masala. 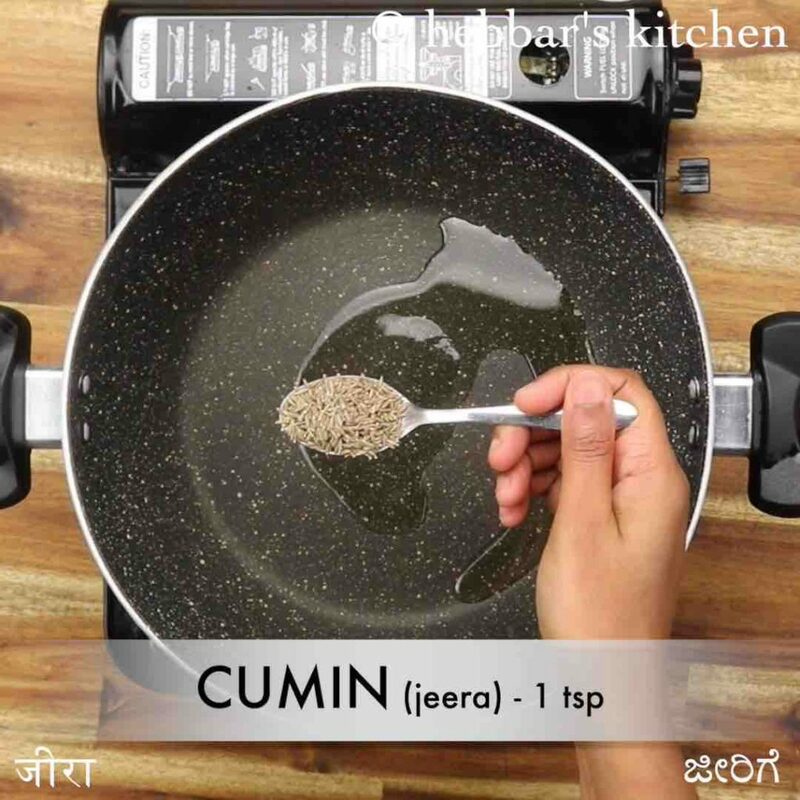 add 1½ cup wheat flour, ¼ tsp ajwain, 2 tbsp coriander and 1 tsp salt. knead to smooth and soft dough adding water as required. 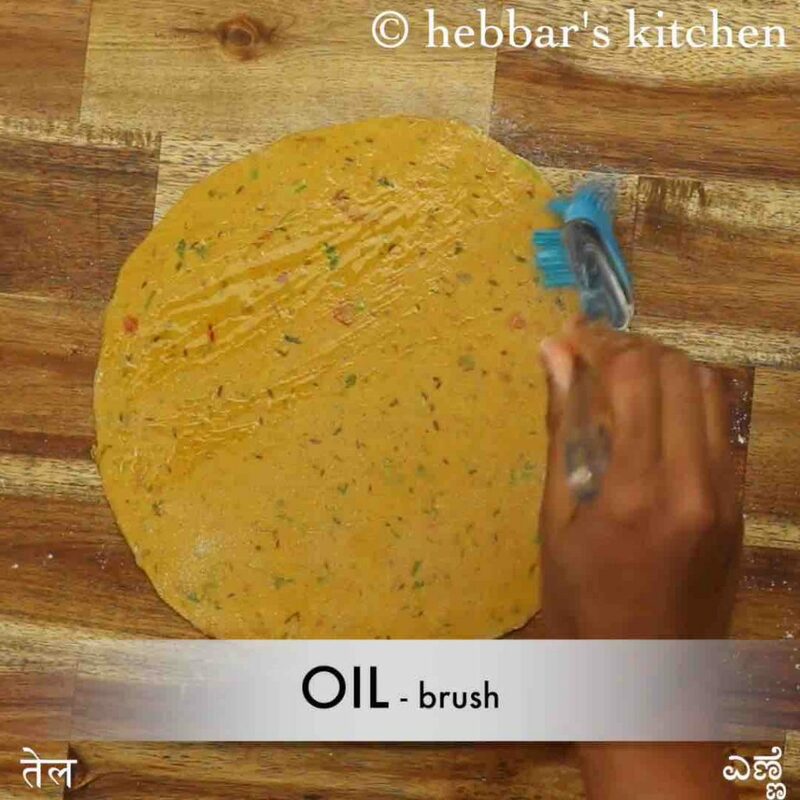 now roll and roast the paratha with oil or ghee. 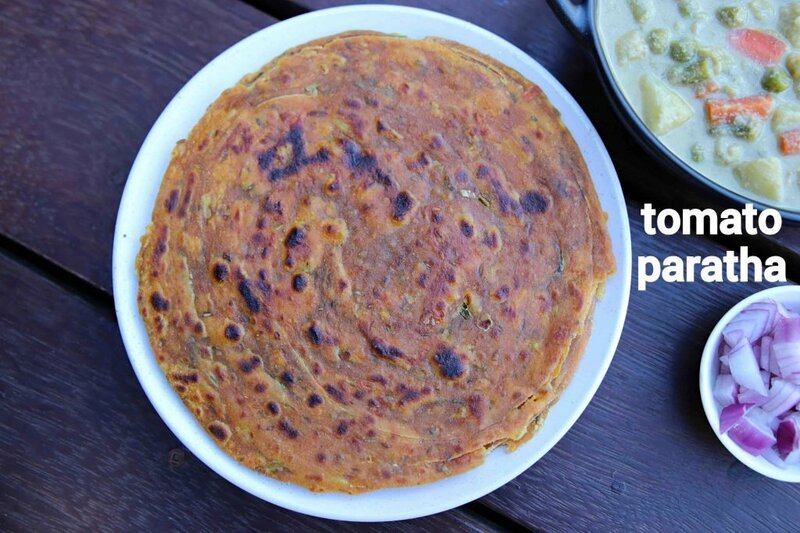 finally, serve tomato paratha immediately with veg kurma or any curry of your choice. 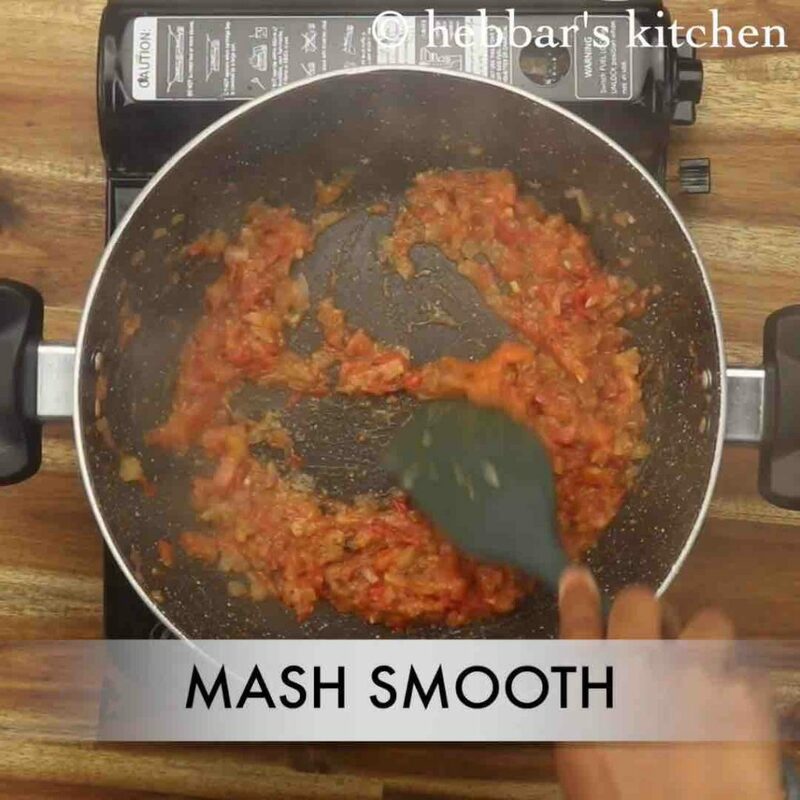 mash the tomatoes until it turns soft and mushy. 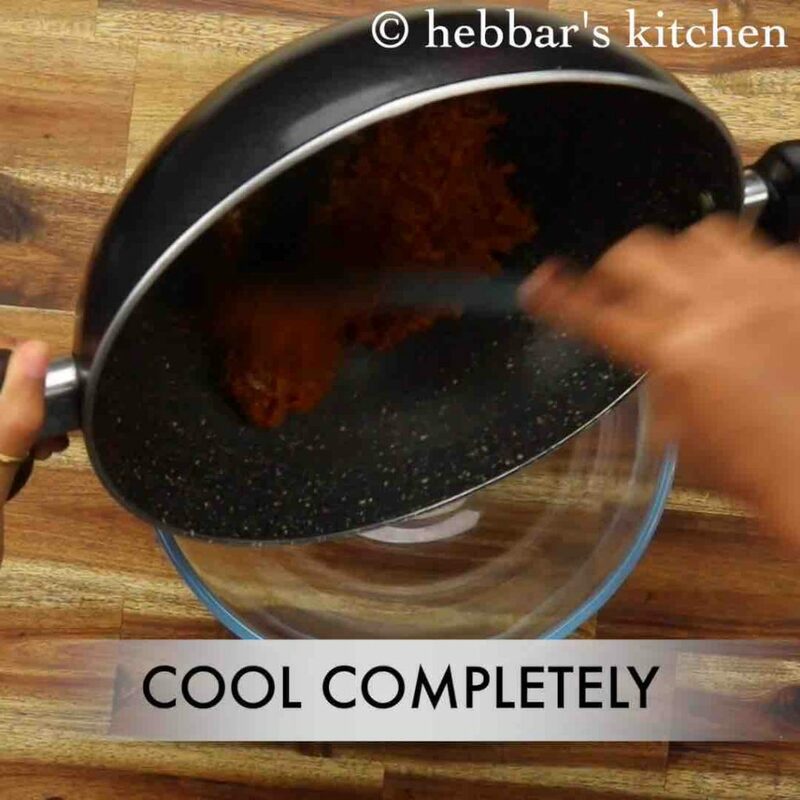 cool the mixture and transfer to a large mixing bowl. 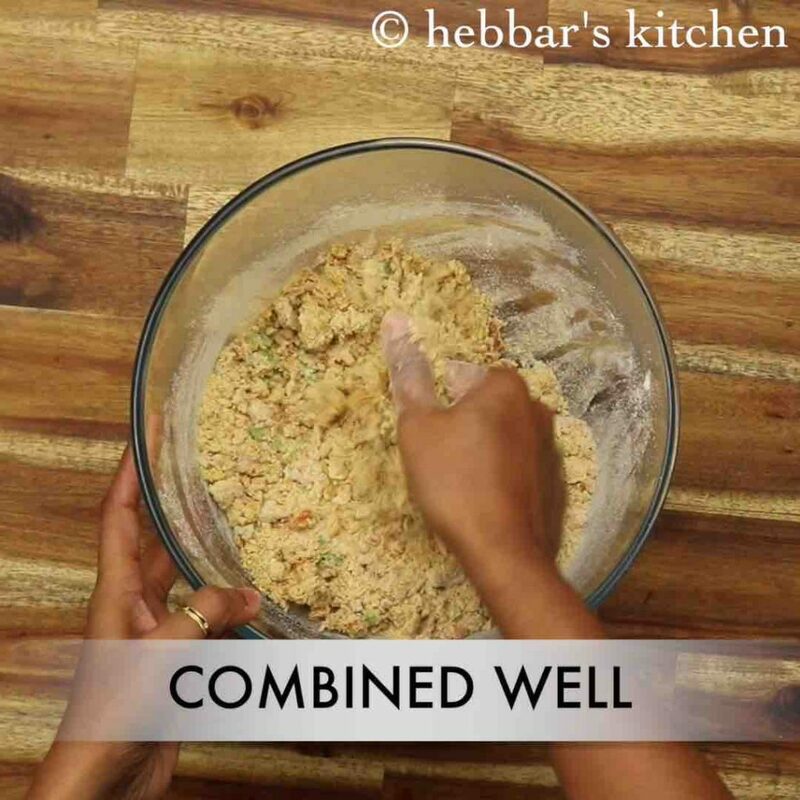 crumble and mix until the masala is well combined. 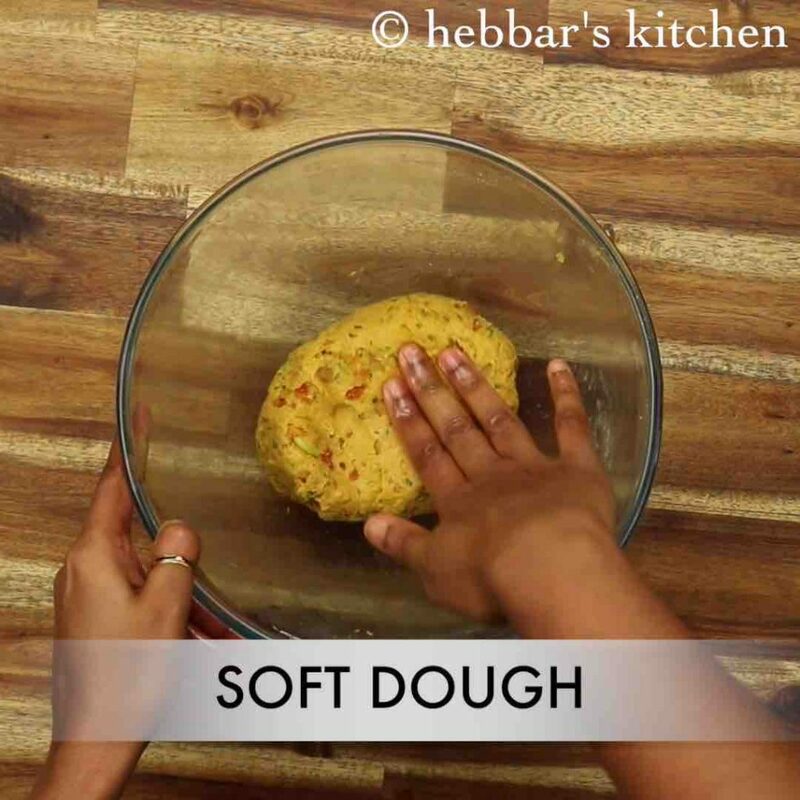 add ¼ cup water or as required and knead the dough. 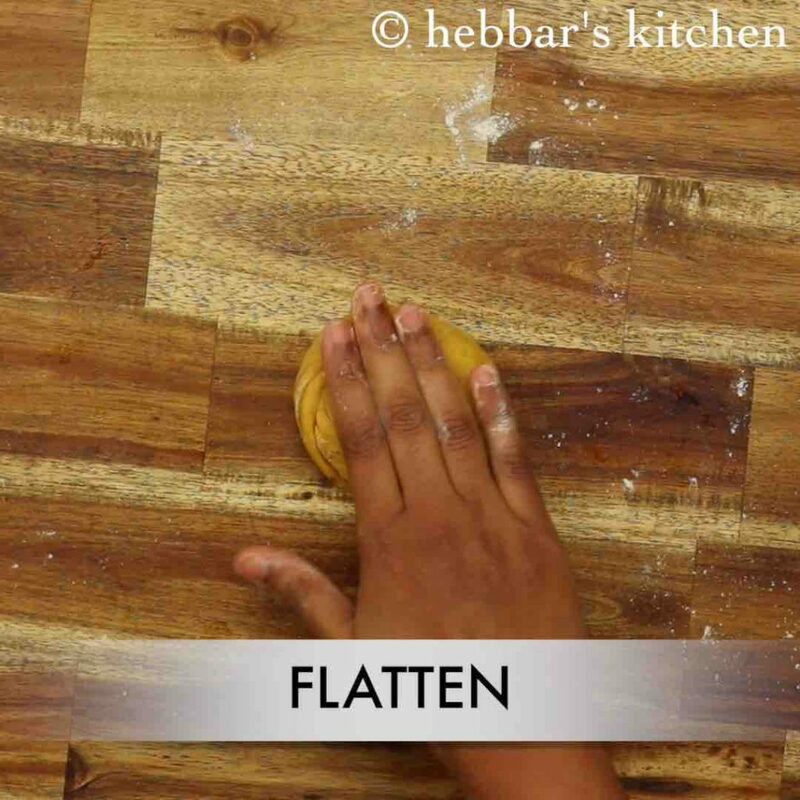 pinch a small ball sized dough and flatten. also dust with some wheat flour. 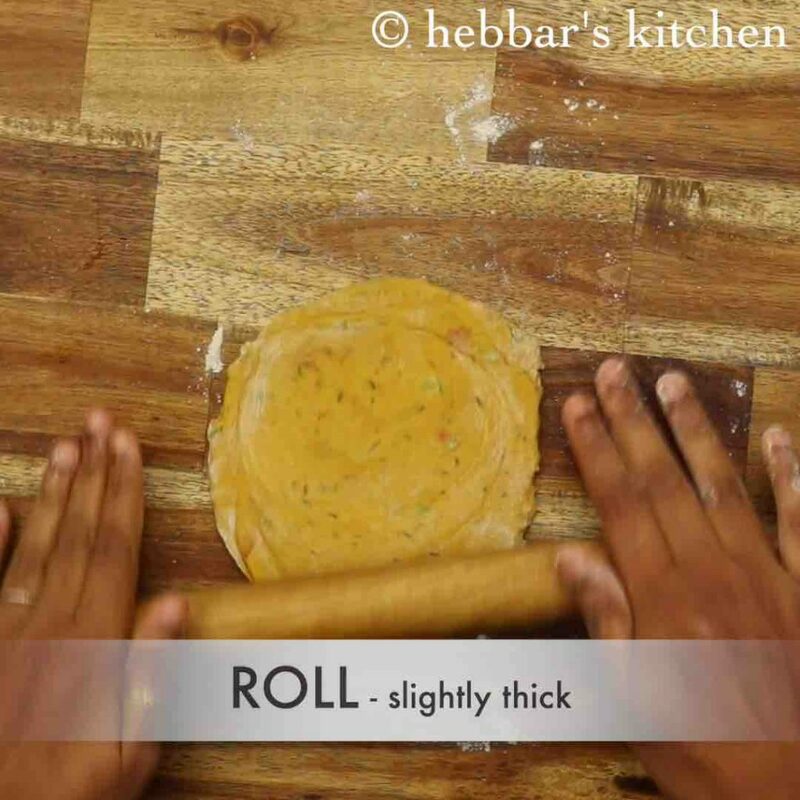 furthermore, roll it into a thin circle as of chapati. roll as thin as possible. 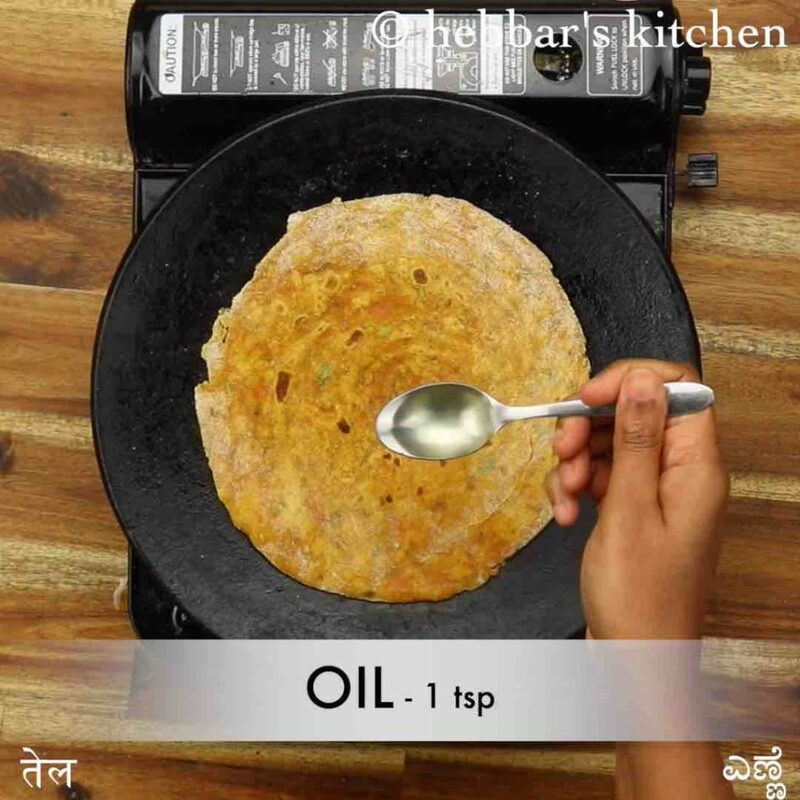 grease the chapati with oil and sprinkle wheat flour over it. this helps to get flakey layers. furthermore, secure the end by pressing gently. 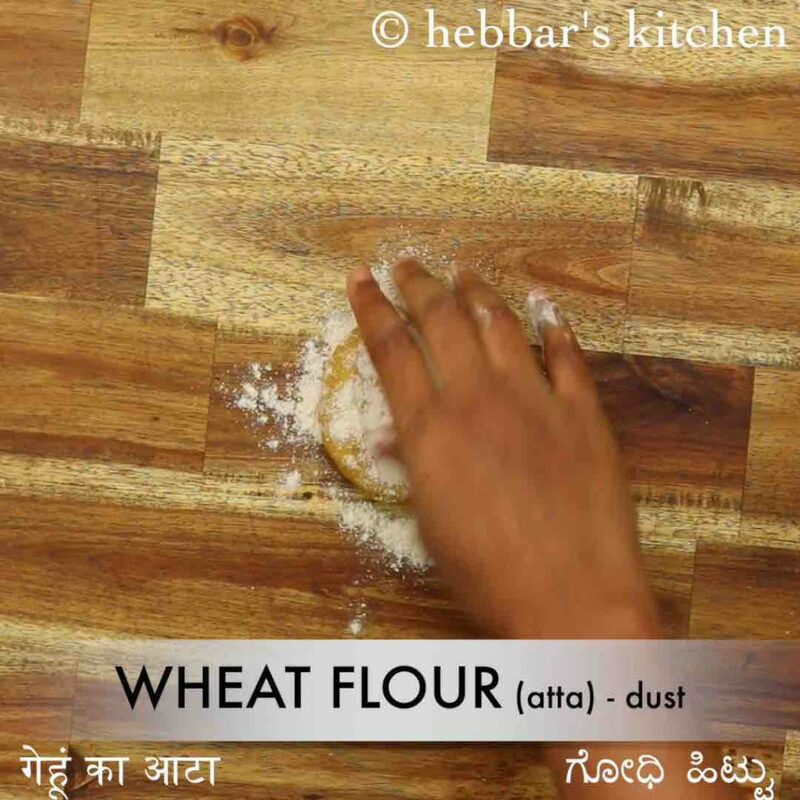 take the rolled ball and dust with some wheat flour. and start rolling to a slightly thick circle. 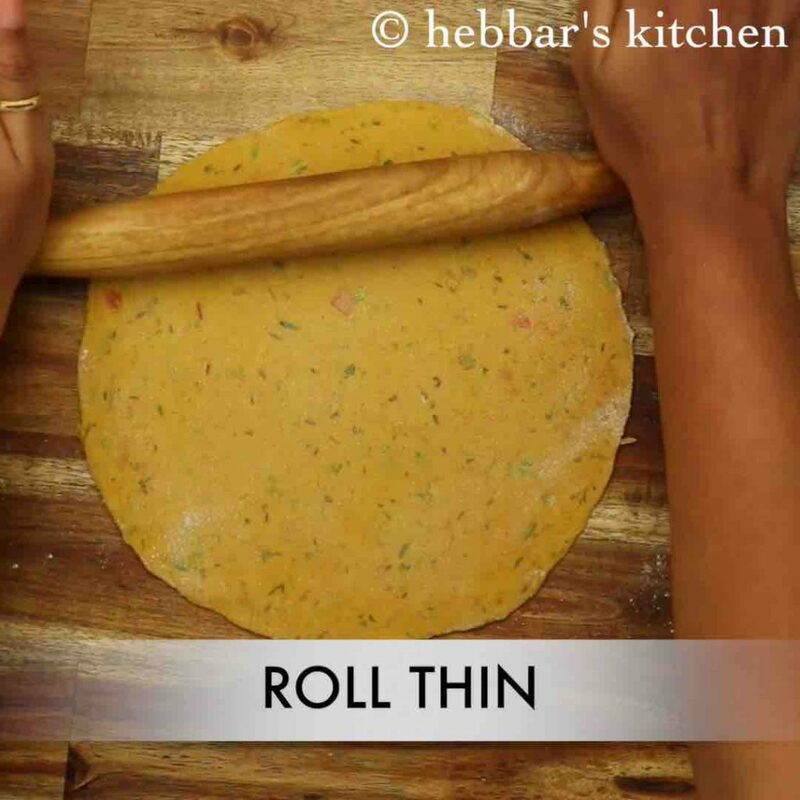 do not roll too thin as you wont be able to enjoy the layers. 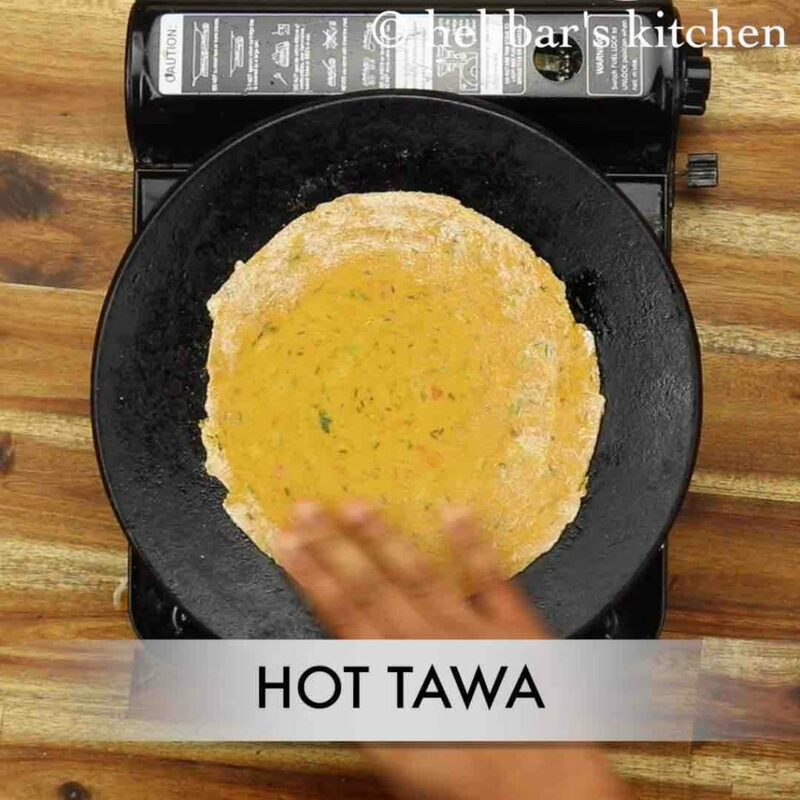 take hot tawa and place the rolled paratha. furthermore, flip and roast both sides. then crush the paratha to form layers. 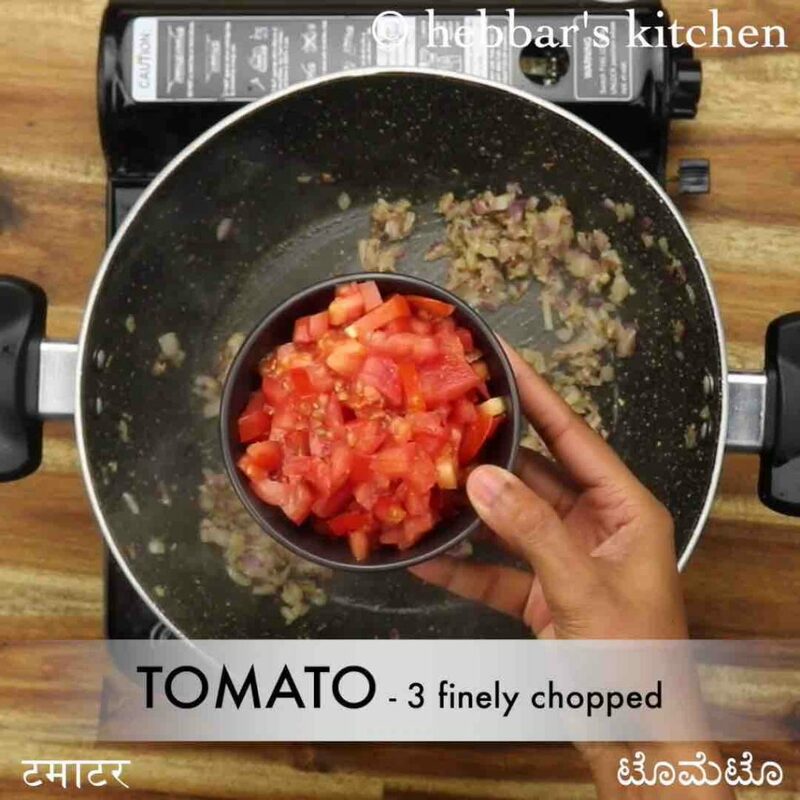 firstly, use ripened tomatoes to get an intense flavour. also, if you are running short of time, then blend tomato to a paste and knead the dough. additionally, preparing lachha paratha style is optional. finally, tomato paratha or tomato onion paratha recipe tastes good when prepared slightly spicy and tangy.